A Russian soyuz rocket lofts the recoverable Foton M-2 spacecraft on a 16-day mission to fly numerous experiments in orbit, some of which were orginally flown aboard NASA's lost Columbia flight STS-107 and the ill-fated Foton M-1 mission. Aninternational collection of experiments safely returned to Earth today with afiery sunrise re-entry aboard the recoverable Foton space capsule after spendingover two weeks conducting operations and studies in orbit. The Foton-M2 craft plummetedback to Earth and touched down about 90 miles southeast of the town of Kostanayin Kazakhstan, close to the Russian border at 0837 GMT (4:37 a.m. EDT). Acontingent of Russian military helicopters and jeeps was dispatched from a basein the city of Orenburg. "The Foton-M2 missionhas been a resounding success and I look forward to seeing the positive impactthe results of the experiments will have in the future," said DanielSacotte, the European Space Agency's director of human spaceflight for microgravityand exploration programs. The spherical entry moduleseparated from the other components of the Foton spacecraft after a 45-secondburn was conducted high above South Africa to send the capsule on a path intoEarth's atmosphere. After a fall through theatmosphere protected by an ablative head shield, three parachutes were deployedto slow the entry vehicle prior to touchdown. While descending toward theground under the main parachute, the Foton was to have fired braking rockets tofurther cushion the impact. Inside the return capsulewas a wide variety of international experiments designed to take advantage ofthe microgravity environment for research in many scientific disciplines,engineering tests, and technology demonstrations. The Foton was packed with atotal of about 1,200 pounds of payloads mainly from European nations. Scientists accompanied therecovery team to the landing site to retrieve a number of time-criticalexperiments, while the Foton capsule itself is planned to transported by air toits factory in Samara, Russia. Officials will then analyze the performance ofthe spacecraft and determine the final results of many of the experiments itcarried. 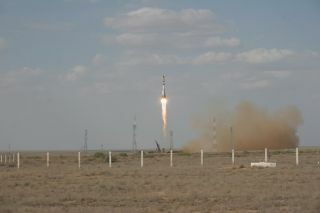 Launched on May 31 aboard aSoyuz rocket from the Baikonur Cosmodrome, the unmanned Foton-M2 craft spentabout 16 days in a slightly elliptical orbit with an apogee of about 180 miles,a perigee of around 160 miles, and an inclination of 63 degrees. The Fotoncompleted over 250 orbits during its time in space. Many of the scientificinvestigations that found their way to space aboard the Foton were reflownafter their Foton-M1 capsule was destroyed when its Soyuz booster explodedseconds after liftoff in October 2002. All the experiments on the failed flightwere on this mission with the exception of a French biological incubator and afew student experiments, European Space Agency Foton project manager AntonioVerga told Spaceflight Now. An applicable technologydemonstration called Favorite - for Fixed Alkaline Vapor Oxygen ReclamationIn-flight Techonology Experiment - was planned to test a new way to generateoxygen from water molecules. Called electrolysis, theprocess splits hydrogen and oxygen elements from water molecules to be used forbreathing aboard manned spacecraft such as the international space station. Thetwo-man crew on the station normally relies on a Russian Elektron system, butthat unit recently malfunctioned, leaving the astronauts to use a backup methodthat produces oxygen through the burning of solid-fuel "candles." The Favorite hardwareaboard the Foton capsule is a newly developed design from Europe that"does not contain moving parts, making it inherently simpler and morereliable," according to an ESA fact sheet. The system was planned tooperate for about 40 hours near the end of the flight and was expected toproduce 13 liters of oxygen per hour from an average energy usage of about 290watts. This amount of breathable oxygen is enough to supply half an astronaut. An experiment originallyflown aboard Columbia's ill-fated mission in 2003 was also launched into spaceaboard the Foton capsule. This effort dealt will heat pipes for thermal controlsystems on future spacecraft. The largest of the payloadswas an automatic fluid physics facility containing four individual experiments.At 390 pounds, FluidPac comprised almost half the internal volume of theFoton's entry module. A 59-pound exposureexperiment housed on the outside of the entry capsule called Biopan contained anumber of organic samples such as bacteria and fungi cells. Other bacterialspores were placed in a simulated environment similar to that on the surface ofMars to evaluate their performance in such harsh conditions. Several re-entryexperiments tested new reusable heat shield technologies made of a ceramiccomposite material and how the high temperature affects organic compounds likeamino acids and rocks containing imbedded microbes. In addition, a precursorexperiment for a future ESA research facility to fly on the international spacestation carried two scorpions to space to test the affects on the animals ofthe launch vibrations and fiery re-entry into the atmosphere. Other components of theFoton's science complement examined how crystals grow in space, analyzed thebehavior of molten metal alloys in weightlessness, and showed how single-cellwater organisms react to space. A small capsule known asFotino had been slated to be riding as a piggyback payload on the launch, butthe small student-built sphere was removed due to inadequate funding. Developedby 100 European students, Fotino was supposed to be released by the Fotonbefore entering the Earth's atmosphere to test a number of inexpensivetechnologies in advance of the larger Young Engineers Satellite-2 mission. The next Foton flight in2006 will carry YES2 to demonstrate a tether-based inflatable entry vehiclethat uses no rocket engines or parachutes. This mission marked the11th time the European Space Agency has significantly participated in flightsinvolving the Foton capsule and its predecessor called Bion dating back to1987. "I am extremelypleased that the majority of experiments have performed well," Verga saidin a post-landing statement. "My thanks to the ESA Operations Team who hasclosely followed the mission from the Payload Operations Centre at Esrange inKiruna, Sweden and our Russian counterparts at Roskosmos, TsSKB-Progress andthe Barmin Design Bureau for General Engineering. The hard work and dedicationof everyone involved has been crucial in making this mission a success andoptimizing the scientific returns from the mission." The Foton's design is basedon the Russian Vostok craft that cosmonaut pioneer Yuri Gagarin rode to andfrom orbit in the first human spaceflight in 1961. Russia flew twelve Fotonmissions 1985 through 1999, followed three years later by the botched Foton-M1launch. The Foton-M craft features several improvements over earlier capsulessuch as a larger battery capacity to allow larger payloads with higher powerconsumption. The next mission in theFoton program is scheduled for October 2006 when Foton-M3 will carry anotherlarge research complement into orbit. "Beyond Foton-M3, there are plans tocontinue the program with even wider scientific objectives," Verga said. "Formal discussions are still to be held."